Less than two dozen sport fishermen have caught all 9 billfish constituting the World Slam: Pacific Sailfish, Pacific Blue Marlin, Striped Marlin, White Marlin, Black Marlin, Swordfish, Atlantic Sailfish, Atlantic Blue Marlin, and Pacific Spearfish. Lad Shunneson recently boated #8, an Atlantic Blue Marlin, on an incredible 7-day fishing trip to Puerto Rico that you can book with Lad as your host. 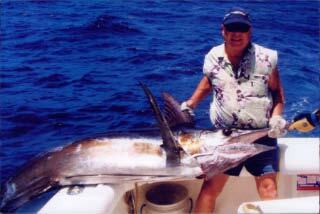 You will have three full days fishing for Atlantic Blue Marlin or White Marlin plus Atlantic Sailfish (3 of the 9!!) and, on the fourth day, you go for Tarpon AND Peacock Bass!! There is no other fishing trip like it in the world. And the price is only $4,585 per person!! What billfish does Lad still need for the World Slam? It's the Pacific Spearfish, which Lad says will be relatively easy to boat off beautiful Hawaii. You can join him on that trip also, plus he has packages for all the World Slam Billfish with most priced at $3,650 or less. 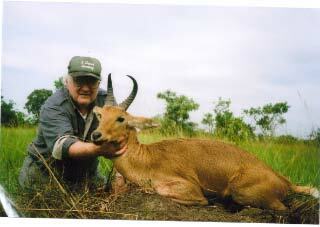 Chris Weth has received 3 more East African Sitatunga permits for his prolific concession in the Kafu River Basin. So Chris is offering a 12-day package (10 hunting days) for only $15,000 for the first 3 hunters to book, but the safari must be completed by December 31. Also on license will be Nile Bushbuck, Uganda Kob, EA Bohor Reedbuck, EA Bush Duiker, Oribi, Jackson's Hartebeest, and EA Defassa Waterbuck (but the Hartebeest and Waterbuck are not sure things). 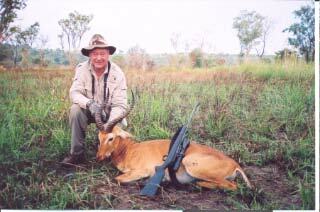 Septuagenerian John Kemhadjian recently returned from his safari with Uganda Wildlife Safaris where he bagged his Sitatunga early and then added several more species. By the way, Ken Wilson met John on Ken's very first hunt during which they both shot Dall Sheep back in 1983. John has expanded his trophy room 6 times since then. 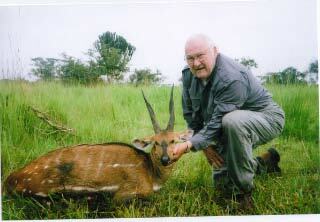 SCI Hall of Famer and Weatherby Nominee Dr. Doug Yajko returned from Uganda a few days ago and raved about the camps and staff and quantity and quality of game on his brief safari with Uganda Wildlife Safaris. Doug photographed herds of Jackson's Hartebeest to help determine if they should be a subspecies of Lelwel's in the SCI Record Book. 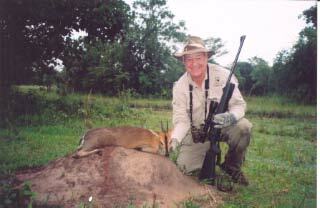 And, in just a couple days of hunting, he shot a Nile Bushbuck and Uganda Kob to add to his hunting experience and species count. 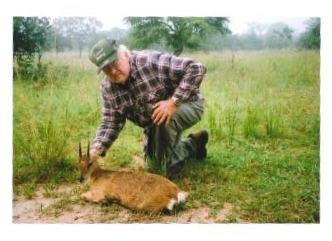 He also shot an EA Bush Duiker to study the markings up close since some believe it should be a subspecies as per James Mellon's comments in African Hunter. 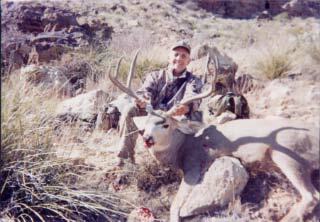 Two openings have just become available for private land New Mexico Mule Deer. The actual hunt dates are October 29 - November 2. You will be personally accompanied by Mr. Mule Deer, Lad Shunneson. The price of $5,150 includes the all-important Landowner Permit, which costs $2,500. 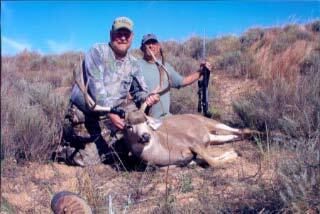 You should shoot a really good Mule Deer after seeing lots of bucks. Two openings have just become available for Newfoundland Moose in the northern trophy area where 45-50" is the expectation. This hunt ordinarily costs $8,650, including the very expensive transportation by helicopter to and from your remote camp, BUT it will now be deeply discounted because it must be taken in about 3 weeks!! 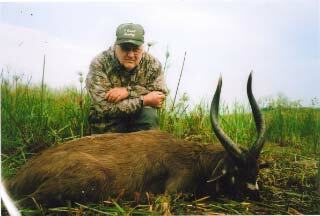 Call quick if you need a trophy Eastern Canada Moose. The 2011-12 season is September 10 - March 10. It takes a month to obtain a visa, so plan ahead and book now for one or more of the 7 species of Sheep, 2 species of Ibex, Persian Gazelle, and Wild Boar. Ken and his son, Ryan, just received their visas for their November shikar. 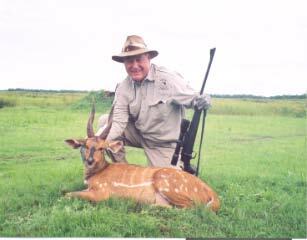 Federico Gellini Safaris will hunt Masailand July and January - March each year, and Kilwa and the Selous August - December each year. There are still openings for Masailand for early 2012, and for all concessions for July 2012 - March 2013. YOU BOTH MENTALLY AND PHYSICALLY.